Mithila is the cultural hub of Bihar and has its own beauty. While Madhubani Painting is gaining its own share of popularity, it is our noble effort to take the Cuisine of Mithila to the world. When we start counting what is unique about Mithila cuisine we found many and the blog is one of the most popular ways to share it with the world. If you are keen to join the team just send me an email and start contributing to the blog and help us spread awareness about mithila cuisine. In mithilnchl Pirikia has got very vital significance. 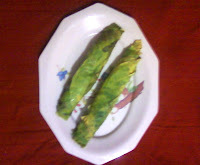 Like Khajas they are also widely used as “Sanesh” (present/gift). They have equal importance in many of the festivities as well in the region . They are as similar as patties with a small difference of not being laminated. The stuffing used for the dish is Khoya (Dry Ricott Cheese mde out of whole milk instead of whey). Khoyas are then flavored with Cardamom, Cinnamon and dry fruits. One can also use the filling of sweetened flavored semolina ( Suji) instead of Khoya. Pirikias being deep fried and having dry rich filling can be stored for up to 20 days. It can be consumed as a secondary meal may be breakfast or evening snacks. Make hard dough of refined flour. Flavor Khoya with cardamom. Add grated coconut, resins, cashew nuts and dates and mix well. Take small chunk of dough and roll it thin. Stuff a spoon of mixture and seal it. You can also give it different fancy shape. Now deep fry it in vanaspati. Arrnge it in a “Changera” Basket and present. “Arikonch” Colocasia leaves are too common in any maithil house to be prepared a good curry item. In fact it is a kind of shrub that crops up near household premises in villages. Colocasia leaves have two different categories, Normal and Wild. One should be careful enough in choosing the leaves, as the later one gives an itching sensation in the mouth. One can see the diversity of cooking method in making Arikonch. Marinated leaves are sun dried, steamed/deep fried and finally cooked in the gravy. This is perhaps one of its type dish where different cooking methods are used together. Arikonch (Colocsi Leaves) : 6 in nos. Red chilly powder. : 15 gms. Salt : as per taste. Wash, clean and trim Arikonch leaves. Make thick paste of besan without salt. Now roll it and sundry for 2-3 hrs. Make smooth paste of mustard seed and chop tomatoes. Steam the rolled leaves for 20 minutes. Heat oil in pan. Add tempering of mustard seed. Add tomatoes, and cook it for some time followed by mustard paste. Put water deriving the mixture to thin pouring curry texture. Lastly put Arikonch slices and bring it to boil. Finish the dish with lemon juice. Garnish and serve. Khaja is a very traditional maithil sweet preparation. They say it being a must in any local function. From Thread ceremony ( Janaayu) to Marriages to Last rites it is a mandate to have Khajas prepared. One can say any function is incomplete with no Khajas incorporated in the menu. Fat (vanaspati preferably): 2 Ltrs. One string Sugar cyrup: 3 ltrs. Make a semi soft dough out of flour and moisture. Flatten it thin with the help of rolling pin in batches. Apply a layer of ghee as shortening agent. Roll it now, cylindrical in shape. Cut the rolled cylinder widthwise in small chunks. Shape the chunks by pressing them softly between your palms. Deep fry till it is crisply done. Dip the fried chunks in sugar cyrup. Take it out allow it to dry again. Araange it in a basket (changera) and present. Baigan Aaloo aur Adauri ke Milauni. 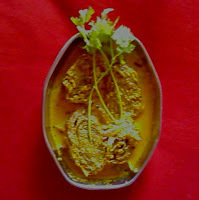 This is one of the lunch time favrouite dish in mithila goes well with bread and rice both. It is a mixed veg preparation with dumplings (Adauri). 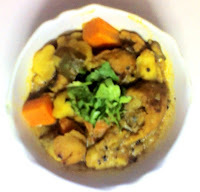 The compulsory body ingredients of this dish are Brinjal, Potato and Dumplings , however some people add white Raddish, Carrot, Tomatoes, Couli flower etc. a tempering of PanchFodan ( a combination of five spices ie Tori, Jeera, Methi, Mangraila or Kaluanji and Saunf ) adds extra flavour to the final product. All the vegetables are partly cooked separately first then mixed together and brought to boiling point. Panch fodan ( Black mustard, Cumin, Fenugreek, Sweet fennel, Nigella) : 3-4 gms. Wash and cut the brinjal and tomatoes into dices. Boil Potatoes with jacket, Peel and break into pieces. Cut carrot into dices and parboil. Separately fry dumplings (Adauri) and take them aside. Heat oil in a pan and add the tempering of Panch fodan. When spices start crackeling add garlic chops and saute . Put in Coriander Pd and Red chilliy pd ( optional) and fry till the flavour of raw masala goes off. Add tomatoes and sweat it with a pinch of salt. Now you can fry brinjals in the masala for a while. 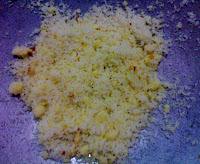 Later put in potato mash and mix it well with the other ingredients. You can also add the boiled carrot and fried dumplings at this stage. Stir and mix the ingredints well. Serve hot with a topping of chopped coriander leaves. 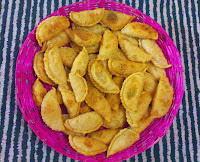 Kachari is counted as one of among the all time favrouite snacks in mithila. 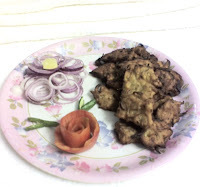 The best accompaniment taken with kachri is “Jhilli” ( deep fried thin strings of batter) or some people even prefer Chhura Bhuja along with it. A leisure evening with Kachri is said to be an ideal evening. In totality this is the best snacks that no one would stand disagreed. Mix it with besan, salt, and ajwaain. Put water and make a paste avoiding any lumps in the mixture. Heat oil in a kadhai and let it come to the smoke point. Put small-small parts of the mixture in the kadhai and deep fry it till golden brown in color. You can also enjoy kachri with Lachha Onion and lemon juice, salt, chilli mixture.